The Vega rocket carrying Europe’s Sentinel-2B satellite in its mobile gantry, at Europe's Spaceport in Kourou, French Guiana, on March 6, 2017, the day of its planned liftoff. The European Space Agency (ESA) plans to launch an Earth-observing satellite tonight (March 6), and you can watch the liftoff live. 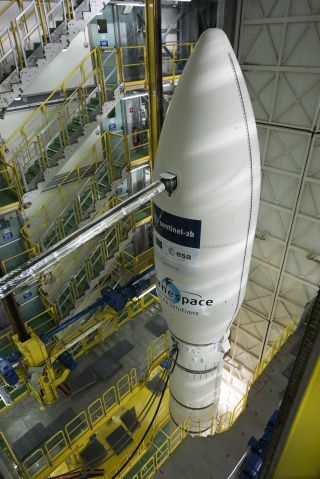 The Sentinel-2B satellite Earth-watching satellite is scheduled to blast off atop a Vega rocket from Kourou, French Guiana at 8:49 p.m. EST tonight (0149 GMT on March 7). You can follow the launch directly via ESA's website site; coverage begins at 7:30 p.m. EST (0030 GMT). You can also watch the launch live here at Space.com, courtesy of ESA. Sentinel-2B is the second member of a two-satellite constellation designed to help keep tabs on the planet and its resources. "The mission mainly provides information for agricultural and forestry practices and for helping manage food security," ESA officials wrote in a statement. "Satellite images can be used to determine various plant indices such as leaf area chlorophyll and water content indexes. This is particularly important for effective yield prediction and applications related to Earth’s vegetation." Imagery from Sentinel-2B and its twin — Sentinel-2A, which launched in June 2015 — will also help scientists and policymakers monitor water pollution and deal with natural disasters such as floods and volcanic eruptions, ESA officials added. If all goes according to plan, the 2,513-lb. (1,140 kilograms) Sentinel-2B will eventually settle into a polar, sun-synchronous orbit about 490 miles (786 kilometers) above Earth. Sentinel-2A occupies the same orbit, but the two satellites will be separated by 180 degrees to maximize the duo's coverage of Earth.